Sign up for LabSmith news, updates and tips in your inbox. By Mike Zecchino on March 18, 2019. The LabSmith uEP01-300 is an extremely compact, fully programmable high voltage supply for controlling electrophoresis and gel electrophoresis setups. Measuring just 8.1 cm (3.2 in.) long, the uEP01 provides constant voltage to 300V, or current or power. Multiple modules can be controlled together for fully-independent, multi-channel control. The uEP01 is part of the uProcess platform, which includes hardware (uDevices) and software (uProcess) products for constructing and automating microfluidic systems. The uEP01 can be used in conjunction with LabSmith pressure sensors and temperature sensors for constant pressure or temperature modes and can be integrated into complete systems using uProcess control software. By technician on September 12, 2018. The LabSmith AV801 selector valve is the newest addition to our uProcess line of automated microfluidic control products . The compact AV801 has 8 selector ports and one common port, with models available in for connection to 360 um or 1/16″ OD capillary. The AV801 is part of the uProcess platform, which includes hardware (uDevices) and software (uProcess) products that simplify construction and automate control of microfluidic systems. Other uDevices offered by LabSmith include syringe pumps, pressure sensors, temperature sensors, and temperature controllers. By sarah on September 29, 2015. Need faster, higher-resolution separations? Need to use long micro-channels? LabSmith’s HVS448 high voltage sequencers are now available with an 8000 V differential range. The HVS448-8000D includes all of the same great control and software features as our other sequencers, like precise voltage and current supply or sensing, millisecond switching, and 8-channel coordinated control. The HVS448-8000D is available in both our standard configuration and our low current configuration with 13 nA monitor resolution for nanofluidic applications. Click here for more information or to purchase. By sarah on December 8, 2014. Controlling pumps, valves or sensors? No more RS232-USB adapters required! LabSmith now offers its uProcess™ interface with USB communication. The new electronic interface board (EIB200) controls over 100 uDevices for sequential operation and up to 10 uDevices for simultaneous operation. 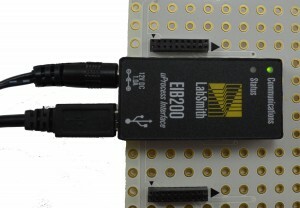 Priced the same as the original EIB100 (RS232 connection) it includes uProcess software, power supply, micro USB 2.0 cable, and flat ribbon connection cable. The EIB200 is compatible with uProcess Software versions 1.24.4 and later. Click here for more information or to purchase.